St. Mane, Ted. 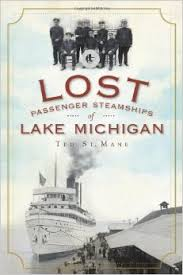 Lost Passenger Steamships of Michigan. Charleston, SC: The History Press. 2010. All but non-existent today, steamships were once a flourishing industry moving cargo and passengers across the Great Lakes. Full of steamship and vessel history, renditions of passenger experiences, the role of war on the Lakes, the effect of westward expansion, and the life of working on the Lakes (at the height of passenger steamer service in 1890, captains made the wage of $109 per month! ), Lost Passenger Steamships of Lake Michigan is complete with pictures to be a compact history lesson. Though not specific to Lake Michigan passenger steamships as the title suggests, it was still a very interesting book chock full of historical information. I appreciated and enjoyed the included pictures as well as the personal stories and accounts interwoven throughout the information. Easy to read and follow, this book was wonderful to fulfill a personal interest but would also work well as a reference book for school reports, history buffs and shipping fans. An excellent resource. 4.5 (out of 5) pennies. This entry was posted in History and tagged Adventure, Great Lakes, History, Lake Michigan, Lost Passenger Steamships, Passenger Steamships, Shipping, Ted St. Mane by Savurbks. Bookmark the permalink.